Within the scope of the JEC Asia trade fair in Seoul in November 2018, Daimler AG, and consequently its development partners Quadrant Plastic Composites AG and Quadrant Metal Plastic Solutions GmbH, was nominated for a JEC Asia Award in the e-mobility category. The nominated part involves a mount for the “vehicle-integrated inductive charging system”, the so-called secondary coil of a wireless charging system. The system also incorporates a floor plate with an integrated primary coil that is positioned under the car, on the garage floor for example. Electric power is transferred wirelessly, without the need for a charging cable. With an efficiency rate of more than 90 percent, the high-voltage vehicle batteries can be efficiently, conveniently and safely charged (Source). Charging can take place in passing, even during short stops, and requires no action on the part of the driver. However, there are challenges. In addition to battery protection, these also specifically involve the high-voltage components. In response to the challenges, within the scope of its electric offensive Daimler AG developed an innovative HV protection system that meets all the passive safety requirements (Source). To fulfil these stringent safety requirements, Quadrant Metal Plastic Solutions GmbH took on the development assignment in its capacity as a longstanding development supplier to Daimler AG and specialist for the design of GMT and GMTex® components. In cooperation with Daimler AG, solutions were worked out that met requirements in terms of crash behaviour, fatigue strength/fatigue testing and ground contact (front of vehicle bottoming out on a kerb or similar at full load). solution made of aluminium sheet. Similar to all GMT and GMTex® materials from QPC, this material is also processed using the cost-efficient compression moulded process and can be recycled at the end of the vehicle service life. A further material attribute is its permeability with regard to electromagnetic waves, which was an entirely new functional design aspect of the inductive charger mount. 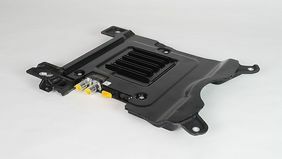 In contrast to the aluminium sheet BENCH system, the mount could be placed underneath the charger unit and consequently fulfil its role of providing protection against mechanical impact from below without influencing or shielding the magnetic field lines. An additional reinforced underbody shield could also be omitted. effectively confirmed QMPS development results in all areas. The part will be displayed on the JEC “Innovation Planet” stand at further exhibitions within the scope of a world tour.